Welcome to 2019! I hope you all had an enjoyable time over the holidays. Did you have lots of tasty meals, some sourced from the supermarket and maybe a few from the local butchers? In some areas of course there are no local butchers, but what about historically, here in our town? One of the early shops was Messrs GF Targett, who were situated in Aldwick Road at one time. However, reading about their business what I did find interesting was that in their early days, they would purchase the sheep, cows etc. at the market in Barnham and they would be driven, i.e. walked, from the market down through Westergate and Shripney to their own abattoir in Argyle Road, where today there is a car showroom. The cost of a bullock in 1914 was £18. In the early days there were many schools in the area and Targett’s supplied the meat to each of these premises. Thus, with the school closures, this trade slowed. However, by the mid-1920s, the company had numerous shops around West Sussex. Their business also included various provisions and also fish, which was sourced locally. 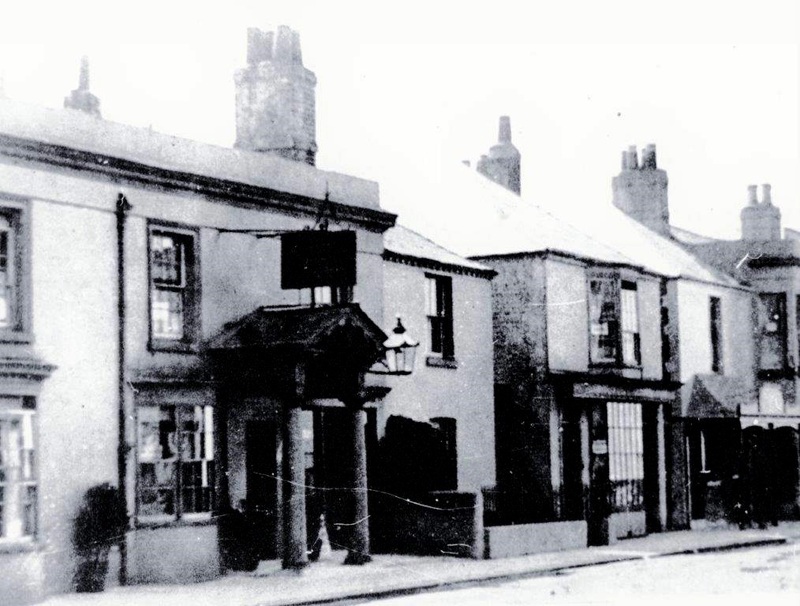 In West Street there was the family business of Field’s Butchers’ shop who established their own place in the history of this town. Field’s, long since gone, was one of the earliest traders, which was established in 1804. Five generations of the family ran the shop, but like many other businesses, either time or legislation has forced these generations to cease their trading. This building is now another private residence, but happily still displaying the ‘Field’ sign on the front of the premises in tiles. In a 1932 programme for Bognor Regis Gala Week, there are numerous advertisements, many for butchers, including L Ley and Son, again of Aldwick Road, who sold ‘high class meat’ with special terms ‘to large consumers’. Another well-known name advertising was that of W Parfrement and Sons, who had shops in the High Street and London Road. Here they proclaimed that they were under Royal patronage. They also had an abattoir, which I believe was in Belmont Street. Sheep were penned in Waterloo Square until required for the abattoir. Like so many of the butchers of the time, they advertised the origins of their meat, Devon Beef, Southdown Mutton and lamb. Another in London Road was W Woodford, who was also fishmonger and a poulterer. In this programme there is an advertisement for JG Ragless who was promoted as a fishmonger, poulterer and an ice merchant. We can easily forget that these shops had to store their food, but without the modern convenience of the fridges and freezer units that we have today. In December, 1937, Knight, ‘The Butcher of London Road’, announced in the press that it had acquired a large supply of good quality Christmas fare – for example ox, beef, dairy-fed pork, tongue, legs of pork, prime local turkeys, geese, chickens, ducks, rabbits etc. In December, 1939, one butcher advertised it had available 800 prime turkeys, 600 legs of pork at 7s/6d (37.5p) each with a suggestion to order early for Christmas. E Nixon of London Road advertised frequently in the 1930s and one of its catch phrases was ‘Families waited upon daily for orders. Personal Supervision’. Again, it advertised homemade sausages made daily – there was so much choice for sausages around the town. They also promoted home- killed scotch meat and imported meat, which for a time was quite unusual. During the Second World War, there are numerous stories of people queuing when word was heard of the arrival of sausages at Mant’s. The butcher was renowned for its sausages for more than 35 years. During the war, of course, meat was rationed, but one week the shop received a double ration and produced 3,000lbs of sausages, all sold under strict rationing controls. Orders were delivered in the 1930s and it was once reported that a tray of meat was carried to Craigweil and then the boy had to walk to Middleton with another order. No van deliveries then. An interesting article from March, 1947, stated there were public notices about the butchers in various shops in Bognor Regis who wished to draw the attention of the public to the fact they were not responsible for the quality of the meat being issued by the Ministry of Food. It requested customers to help their butcher by accepting the class of meat he offered. Nothing would be achieved by registering elsewhere to obtain better meat as all butchers had the same quality allocated to them. There was also a letter from a reader commenting on the poor quality of meat in the shops, and commenting that, while it was not the fault of the butchers, suggested that they could perhaps refuse to take the third grade meat they were being offered. The problem obviously continued as in February, 1954, the town’s butchers again protested with good results. They had received a reply from the Ministry of Food to the telegram-protest they sent to Lloyd-George a week before about the poor quality of meat intended for sausages and pies. In July, 1958, there was a situation vacancy for J Sainsbury who were at No 31 London Road. Applicants for trainee butcher were sought from ex-servicemen. The commencing wage for under 20s was £8.5s 6d (ie £8.25p) rising to a guaranteed wage of £10 within 2 years. Accommodation was provided when attending the initial training course at the firm’s training department in London. Today, many local butchers have ceased trading because of the meat counters in our supermarkets. However, we are lucky that we have Turner’s, who make and sell their famous meat pies around West Sussex.